Ever since Maximus ravaged an empire in his quest for vengeance in GLADIATOR, the swords-and-sandals genre has become increasingly formulaic from a musical perspective. Ridley Scott’s epic revived the genre and as a result dictated the musical formula for many scores that followed in its wake. 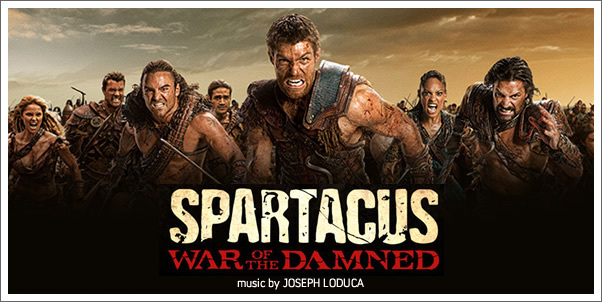 SPARTACUS: WAR OF THE DAMNED, scored by JOSEPH LODUCA, has inherited the scattered genes of GLADIATOR with notable influences from TYLER BATES’ 300 and the many GOD OF WAR games. For much of the score, SPARTACUS leans more towards the latter two, occasionally strikingly so. LODUCA’S is a good example of a score achieving the minimum that an audience would expect from it. There is nothing that attacks the tropes of the genre, nothing that challenges the listener, and nothing that will have you frantically scrambling to click the replay button. It’s a very safe score and suffers as a result. WAR OF THE DAMNED is the third complete series in the SPARTACUS saga, each having been scored by LODUCA. The composer has certainly had time to perfect his approach to the series’ musical backdrop, but perhaps this is the making of what is ultimately a very generic and forgettable score.